Aurora Password Manager 3.21 has been released. SuperPaste is a feature that simplifies the process of filling various forms, either in the Internet or application dialog windows. This plug-in for popular Internet Explorer and FireFox browsers allows you to save and then automatically fill out web forms with data. There is an Aurora Password Manager mailing list, where we discuss bugs, features, project ideas and beta testing. Free Online Password Generator - generate a strong truly random password. 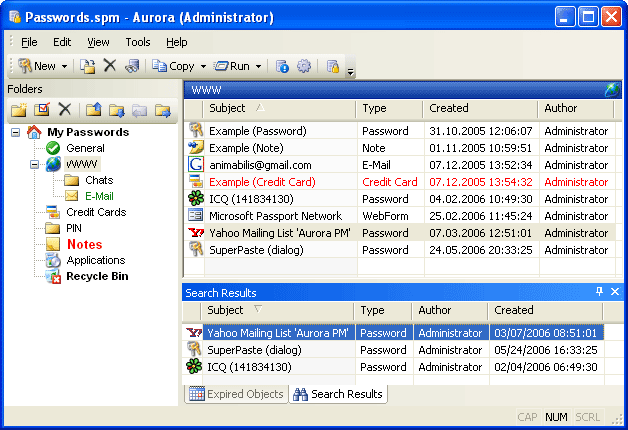 Aurora Password Manager is a full-featured solution for storing website and e-mail access passwords, credit card numbers and other sensitive data. Multi-user and privilege management support makes it an ideal solution for both corporate and individual users. 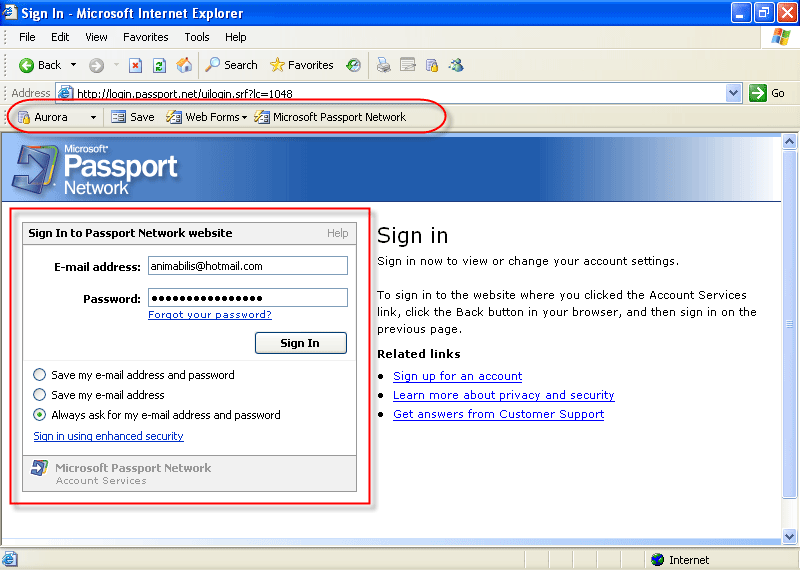 A built-in advanced password generator helps you to create 100% secure passwords, and the Internet Explorer and FireFox toolbar plug-in provides automatic web-form filling functionality. 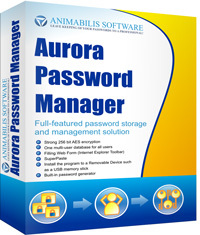 Aurora Password Manager keeps your passwords secure and easy to manage. One 'Master Password' is all that is needed to access all your passwords and private information. Sensitive information needs to be kept secure, and Aurora Password Manager is the sure way to store and protect your private data. This application is handy for storing and editing diverse confidential data, such as your credit card account information, your cell phone PIN, a code to a cipher lock, website login information, email access information, and the like. Face it, our memory is not perfect and we tend to forget these important pieces of information. Now you have a way to keep this information always at hand and keep it secure at the same time. This utility locks all stored information with a strong 256-bit AES (Advanced Encryption Standard) master password which ensures its safety. Aurora Password Manager can also generate a strong password for whatever you need by using its built-in advanced password generator. The generator randomly chooses a combination of case-sensitive letters, numbers, and characters. You then can copy and paste this to whatever website or program you need. All of these passwords are stored in this electronic safe and are instantly accessible only if the correct master password is entered. All information that you trust Aurora to keep is saved as special database files, which can be easily edited, moved or renamed. The software tool uses automatic backup feature that guarantees that your data won't be lost even if a power cut occurs. It provides a variety of predefined templates for commonly used records such as Web site and Email accounts, so you can get started adding data right after you've installed it. What's more, it supports multi-user work. The program is virtually an SQL database, featuring simultaneous work of several users. When Aurora Password Manager is running in the clever password-protected lock mode it prevents unauthorized access to your data when you are away. In addition to this, the utility has a well-designed multi-user interface, and you can pick a “skin” that suites you.